1. Between the parietal bones or cartilages. 2. Situated between the walls of organs. To question formally: It became necessary to interpellate the mayor regarding the charges of corruption. To insert or to place someone or something between two or more things or people: Edmond likes to interpolate clever quotations from various writers into his speeches. The news reporter was allowed to interpellate the politician during an interview. When Lenora prepared her report, she attempted to interpolate direct quotations with the facts gleaned during her interview. Situated between two successive phalanges (joints) of a finger or toe; denoting the finger or toe joints. The Sun emits blobs of plasma (known as the solar wind). Depending on the geometry, rays through different blobs can be focused to a single point. A sort of "twinkling" known as interplanetary scintillation can therefore be observed. To insert words into texts; often altering and falsifying it: Someone apparently interpolated the text of the police report about the automobile crash. © ALL rights are reserved. 1. To interrupt either verbally or by placing something or oneself between other people or objects: The teacher, Mrs. Dawson, interposed herself between the two boys who were fighting. 2. 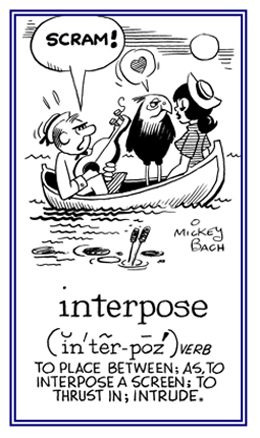 To say something as an interruption: Becky is always interposing herself into the conversations of other people. 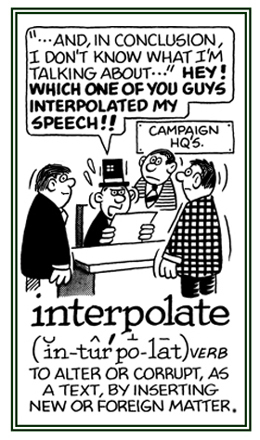 During the TV debate, one of the other participants suggested that he would like to interpose a personal comment. © ALL rights are reserved. The fact of or act of interrupting or pushing oneself into a situation: David's frequent interpositions into our conversations became very irritating. Gerald was prevented from taking his life by the interposition of his wife. Showing page 13 out of 18 pages of 260 main-word entries or main-word-entry groups.